Professor David O'Brart became involved with laser refractive surgery, when he conducted some of the first ever clinical trials of these surgeries in the early 1990s and has continued to be involved in its development. He is an international expert who has published over 120 scientific papers in major ophthalmic journals and has written books and contributed book chapters to major texts in this field. He has the longest published follow-up of these procedures within scientific literature. Laser refractive surgery encompasses a variety of techniques, in which a laser is typically used to remove tissue from the cornea to re-shape its surface, thereby correcting refractive errors and allowing reduced dependence from the use of spectacles and contact lenses. 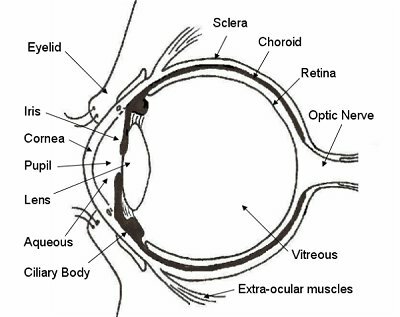 The cornea is the transparent dome over the iris and pupil (the "window" of the eye) and is the main lens surface of the eye. The laser used is called an Excimer laser. It can very precisely remove tissue from the cornea to define a new surface shape. This is akin to etching a contact lens onto the eye. Research and development in this field over the past two decades has resulted in significant advances and refinements, which means that it is now possible to correct most refractive errors with a high degree of predictability and safety. It is important to note, however, that Excimer laser surgery only addresses the corneal refractive power. It does not correct for presbyopia (the inability, to focus the lens inside the eye to read, most often due to ageing,). Dependence on reading spectacles however, in suitable individuals, can be reduced by inducing monovision, in which a short-sighted correction can be fashioned in a patient's non-dominant eye so they can see to read without glasses. The procedure involves removing the surface layer of the cornea (the epithelium) with a blunt scalpel, rotating brush, blunt mechanical blade or the laser itself and then sculpting the surface of the cornea with the laser. The procedure is painless with anaesthetic eye drops used to numb the eye and is over in a matter of minutes. Pain and discomfort for 24 to 72 hours following the treatment is not uncommon. To alleviate this, painkillers and eye-drops are used. A contact lens bandage can also be put on the operated eye for two to three days. The epithelium typically heals within a few days and the eye is then comfortable, although it may be a little sensitive for a week or so. The vision is normally blurred for 7-10 days and then recovers. Initially the eye may be slightly overcorrected but this lessens during the first weeks after surgery. Vision is typically clear by 2 to 4 weeks. Refractive stability can take up to three months. Long term results of up to 12 years, published by the St. Thomas' group, indicate that eyes following PRK are stable after 12 months with no late detrimental effects. With modern advanced Excimer lasers over 98% of eyes, with corrections between +4.5 and -8, will be within +/-1 diopter of zero, allowing patients to see clearly in the distance without the use of spectacles or contact lenses. Occasionally eyes can remain slightly over or under-corrected, which is more common with corrections greater than -6 and +3 diopters, and patients may still require the use of contact lenses/spectacles. These eyes can be re-treated to remove any slight residual error after 6 to 12 months. Other complications include ocular irritation and pain on opening eyes when waking up in the morning. These represent minor symptoms of recurrent corneal erosion syndrome and usually settle within 3 months. In about 1 in 100 patient eyes, symptoms persist and it may be necessary to perform a quick, outpatient procedure, called anterior stromal puncture, to alleviate symptoms if they do not settle by 9-12 months. With PRK, for corrections between +4.5 to -8 diopters and with modern, sophisticated "flying spot" excimer lasers capable of large diameter wavefront optimised treatments, and competent, experienced, fully-trained surgeons, significant and permanent sight threatening complications, not correctable with glasses, are very rare at less than 0.5%. Laser Epithelial Keratomileusis or LASEK is a technique which appears to offer some of the advantages of both PRK (relatively non-invasive) and LASIK (reduced post-operative pain and more rapid visual recovery). In this procedure, instead of removing the corneal surface cells (the epithelium) and discarding them as in PRK, the epithelium is loosened using a dilute alcohol solution or a microkeratome with a blunt blade (also known as Epi-LASIK) to create a hinged skin only flap. This flap of surface skin cells only is gently slid upwards away from over the centre of the cornea and the laser is then used to re-shape the corneal surface. The flap is placed back over the treated corneal surface and covered with a contact lens bandage for two to three days to keep it in place. Published reports of LASEK have been extremely satisfactory. Refractive outcomes have been excellent and as good as those with PRK and LASIK. Reported complications are minimal and comparative studies have indicated that the rare problems encountered with corneal haze may be less frequent than after PRK. Being involved with the latest developments and research in this field over the past 20 years, Professor O'Brart was one of the first surgeons to perform LASEK in the UK. He has been investigating the efficacy of the technique over the past 10 years and has taught the procedure to numerous Ophthalmologists both in the UK and abroad. He ran surgical training courses in LASEK and LASIK for the United Kingdom and Ireland Society of Cataract and Refractive Surgeons for a number of years. A review of LASEK cases treated by Professor O'Brart over the past 20 years (and published in peer-reviewed scientific literature) with a latest generation flying-spot laser, indicates that 98-99% of patients eyes are within +/-1 diopter of the intended correction, for corrections between +5 diopters of long-sight and -8.00 diopters of short-sight, with over 80% of patients eyes achieving unaided vision of 20/20 (or 6/6) or better. These results, together with those of a number of other leading Ophthalmologists, indicate that LASEK is as effective as either PRK or LASIK for corrections between -8 to +4.5 diopters. For higher order corrections it has shown encouraging results for up to +6 diopters of hyperopia and up to -12 diopters of myopia, although in these high corrections post-operative corneal haze must be a concern and such treatments are generally not advised (see use of Mitomycin below). Post-operative discomfort is often less than after PRK, although more prolonged than LASIK. Visual recovery is generally fast, with patients noticing significant improvements during the first week after surgery, except in long-sighted corrections which take longer (weeks/months) to settle. Complications are rare. Flap problems associated with LASIK do not occur and significant sight-threatening corneal haze is a very rare event, less than 0.5% in Professor O'Brart's published cases. Like PRK the procedure does not disturb the deep corneal structure, so that the serious problems with corneal ectasia, seen in a few patients eyes after LASIK, are therefore very unlikely. Unlike LASIK, dry eye problems are rare although, like PRK, problems with recurrent corneal erosions can occur and may require a further procedure to alleviate the symptoms (about 1%). Mitomycin C (MMC) is an anti-cancer agent which, by inhibiting wound healing, can be used to improve the predictability and reduce the risk of haze with high order short and long-sighted PRK and LASEK corrections. It was first used to improve the predictability of PRK treatments as early as 1991. It is applied in a dilute dosage to the surface of the cornea immediately after the laser treatment (usually for less than 30 seconds) and has been shown in numerous scientific publications to reduce the risk of haze. In the early and medium term follow up no adverse complications affecting corneal transparency have been documented with its usage, with the low dosages and limited application times that are currently used, although longer follow-up (>10 years) still needs to be published. Professor O'Brart has been using MMC for selected cases for almost 15 years and reserves its usage for myopic (short-sighted) corrections above -7 to -8 diopters, hyperopic (long-sighted) corrections above +3 diopters and astigmatic corrections greater than 3 diopters. It has, in his experience, been particularly useful for high myopic (short-sighted) corrections with thin corneas where much less tissue needs to be removed for a given correction, providing a biomechanically stable cornea with excellent outcomes and typically no haze, and in complex cases such as those eyes that have previously undergone corneal transplantation. LASIK is a procedure that was originally developed in the mid-1990s to try to treat higher levels of short and long sight not possible with PRK. Since this time the procedure has been refined and significant improvements in efficacy and safety achieved. Professor O'Brart has been performing the procedure for over 20 years and has been particularly interested in the development of the technique for hyperopia, having published a number of important scientific publications in this area. In LASIK a flap is created using an automatic cutter called a Microkerotome, although there are now lasers, called Femtosecond lasers, which can be used to very precisely cut the flap and may offer some advantages over Microkeratomes. It is Professor O'Brart's preference to use such advanced femtosecond laser technology when performing LASIK in order to provide optimum patient care and safety and consistent flap thickness. The flap is approximately one fifth of the total thickness of the cornea and is hinged to the cornea after cutting. Over the years flap-cutting technologies have continued to advance and allow the formation of thinner flaps with more reproducibility and accuracy. It is Professor O'Brart's preference to cut thin LASIK flaps, about one tenth of a millimetre (110 micrometres), so that the mechanical stability of the cornea is compromised as little as possible after surgery - this is also known as Sub-Bowman's Epithelial Keratomileusis or SBK. 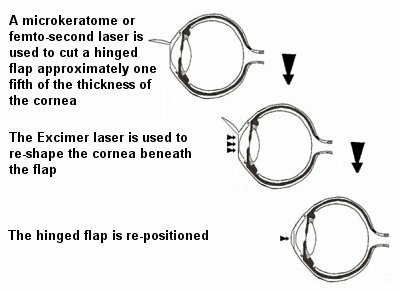 Once cut, the flap is folded away from the cornea to allow the laser treatment to occur on the bed beneath the flap (see diagram below). The flap is then re-placed and after two minutes sticks itself down. No contact lens is required but a see through shield is applied to the operated eye for the first 24 hours and at night for the next week to prevent the flap being dislodged. LASIK was originally designed to treat high levels of myopia, although concerns about long-term stability currently limit the technique to a maximum of about -10 diopters of myopic correction. The technique, like PRK, has been shown to be very effective for corrections up to -8 diopters of myopia, +4.5 diopters of hyperopia and -5 diopters of astigmatism. As the surface skin of the central cornea is typically left undisturbed by the LASIK technique, compared to PRK, there are short-term benefits in that post-operative pain is much less and eyes are typically comfortable within 12 hours. Visual recovery is more rapid, returning within days rather than weeks. Stability of the refraction is more rapid, although it can occasionally take a few weeks, especially with hyperopic corrections. In terms of the actual correction, however, although LASIK allows more rapid recovery during the first few weeks after treatment, after the first month comparative studies have shown no advantages in terms of predictability between PRK, LASIK and LASEK. For corrections up to -8 diopters of myopia and +4.5 diopters of hyperopia, the long-term outcomes of PRK and LASIK are very similar, with over 98% of eyes within +/-1 diopter of the intended correction and therefore not requiring spectacles for distance. For corrections between -7 to -12 and +4 to +6, LASIK tends to be slightly more predictable than PRK, although many studies indicate very similar results for the two procedures, even with these high order corrections. Beyond these limits LASIK is not suitable, because of uncertainties about corneal stability. Under and over-corrections do occasionally occur as for PRK, as do night halos (<0.5%). This is a very rare complication associated with high order corrections, thin or mechanically unstable (keratoconic) corneas. In such eyes the corneas become unstable after and bow forward (ectasia) in an irregular manner months or years after laser surgery. This can be a very serious complication causing significant visual disturbance, even necessitating corneal grafting. Such cases are rare and, with increasing knowledge, getting rarer(less than 0.5%). Knowledgeable surgeons generally regard treatments above 10 diopters as somewhat invasive and do not always recommend them, unless the patients eye is of adequate thickness and mechanically stable. In order to minimise the risk of ectasia careful and thorough pre-operative examination, using the most technology advanced corneal scanning systems, is mandatory to exclude patients with mechanically unstable corneas from LASIK treatment. In addition, advanced flap cutting systems, such as those offered by femtosecond lasers, reduce the risk of thicker than expected flaps being cut. Ectasia has been reported after PRK and LASEK but, as these procedures are less invasive in terms of reducing corneal biomechanical stability, it is a very rare event indeed after these surface procedures. In order to provide the most advanced diagnostic and laser technology for his patients care, Professor O'Brart performs his laser procedures at two highly respected laser centres in Harley Street and Wimpole Street in the heart of London's West End. He uses the latest generation flying-spot Excimer lasers, which have active rapid response eye-tracking systems, reliable German technology and engineering, and provide advanced wavefront-optimised treatments. State of the art pre-operative diagnostic scanning systems are employed and systems, to account for eye rotational errors during surgery(which are especially important in treating high degrees of astigmatism) are available. He has access to the latest femtosecond laser technology, to allow accurate and safe corneal flap creation for all laser, thin-flap LASIK, which is Professor O'Brart's preferred specifications for performing LASIK. Pre-operative examinations and counselling, laser surgeries and aftercare are provided by Professor O'Brart himself. During your consultation, Professor O'Brart will thoroughly discuss your lifestyle (occupation and hobbies), visual needs and visual capabilities, so that any attempted correction can be optimised for your own particular way of life and visual requirements. 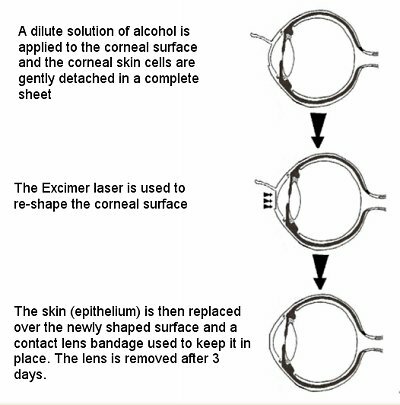 It is important to remember that although long-term follow-up indicates good stability of Excimer laser corrections, the optics of your eye will change with the natural aging process. 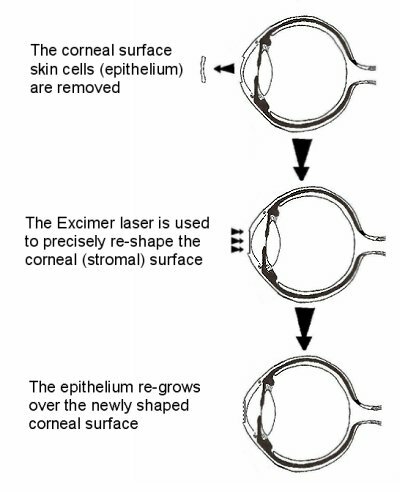 Excimer laser surgery only addresses the corneal refractive power. It does not correct for presbyopia which is the inability, due hardening of the lens with age, to focus the lens to read. Such changes usually begin around the mid-forties and progress until about the age of seventy. Dependence on reading spectacles in suitable individuals can, however, be reduced by inducing a blended mono-vision treatment, in which the dominant eye is corrected fully for distance vision and the non-dominant eye is either treated to induce or left a low short-sighted correction, so that this eye can be used to read without glasses. Many presbyopic individuals may have already tried this type of vision with the use of contact lenses. If not, patients interested in mono-vision correction will be asked to undergo a test trial, using contact lenses, to simulate mono-vision and ensure they are able to adapt to the blended vision. It is important to remember that since mono-vision is a blend of near vision and distance vision there may be instances where the limited use of glasses are indicated, such as driving at night or when reading very fine print for extended periods of time. In addition, if you are an active sportsman e.g. a golfer or tennis player, mono-vision may not be right for you. Other alternatives to presbyopia, such as clear lens/cataract extraction and insertion of a multifocal intraocular lens, can also address this problem and, if appropriate, can be discussed with you. Professor David O'Brart has been a Consultant Ophthalmic Surgeon in private practice and at Guy's and St. Thomas' Hospitals since 1996. He has been involved with laser refractive surgery since the first clinical trials in 1990. He is an international expert who has over 120 scientific publications in major ophthalmic scientific journals and has written books and contributed book chapters to major texts in this field. He is a Past President, Treasurer and Council Member of the United Kingdom and Ireland Society of Cataract and Refractive Surgeons. He has lectured throughout the world and continues to do so. He has organised and chaired numerous symposia, both nationally and internationally, on refractive surgery. Professor O'Brart has extensive experience in all three procedures (PRK, LASIK and LASEK) which he regularly performs. His more recent and extensive experience with LASEK has made this his preferred technique, although continued developments with the advent of femtosecond laser technology and thin-flap LASIK, make this procedure, in his opinion, safer than it was a few years ago and especially suitable, in view of its fast recovery, for long-sighted corrections. If you are interested in refractive laser surgery, please do not hesitate to contact Elizabeth, Christine or Karen on 01702 586656, so that a mutually convenient appointment time can be arranged. The consultation will last between 30 and 45 minutes and will necessitate a full ophthalmic examination followed by a detailed discussion concerning the risks and benefits of refractive surgery. Relatives and friends (space permitting) are more than welcome to attend. Prior to the consultation, contact lenses should not be worn for 1 week for soft lenses or 3 weeks for gas permeable/hard contact lenses. It is best to use public transport and not to drive to the clinic as it will be necessary to dilate your pupils during the ophthalmic examination and this will blur your vision for 6 to 10 hours following the appointment. It will be necessary to be accompanied on the day of surgery and for the return journey home. All patients should arrange to be collected from the clinic as they must not drive themselves home following surgery. A consent form will be sent to the patient prior to surgery. In order to provide optimum and the most advanced diagnostic and laser technology for his patient care, Professor O'Brart performs his laser procedures both at two highly respected laser clinics in Harley and Wimpole Street in the heart of London's West End. Full admission details and directions to the laser clinic will be sent prior to surgery. Prior to the refractive surgery treatment, the refractive measurements will be rechecked and detailed scans of the eye performed. These are painless. There will be time for any last-minute questions to be answered. 15 mins prior to surgery the operated eye will be prepared for surgery and eye drops will be administered, which include anaesthetic, antibiotic and anti-inflammatory properties- these are quite painless. Keep all follow up appointments and take medication as directed. Patients will be asked to attend their first post-operative visit on the third day after LASEK surgery and the first day after LASIK. Post- operative check- ups help to monitor the healing and visual progress, as well as providing the patient with the opportunity to ask any questions they may have. Patients will then be required to return after 1 week and then they are routinely seen at the 1 month and 3, 6 and 12 month stages after surgery. These visits are to ensure that the operation is working well. All eye drops should be brought to each post-operative visit. Modern refractive laser surgery is a safe operation, affording excellent results. However, no surgical procedure is guaranteed to be without complications and problems may occur, albeit rarely. In the unlikely event of a post-operative problem, please call Professor O'Brart's office on 01702 586656 for an urgent appointment. The information set out below is to be taken in conjunction with the advice and counselling received during a consultation appointment with Professor David O'Brart and any connected communication written or oral. Refractive surgery is considered to be safe and effective, but no surgical procedure is 100% safe or effective. Whilst you may have been advised that you are suitable for laser refractive surgery, it is very important to understand any risks and possible complications that may be associated with these treatments, as previously detailed during any consultation. It is necessary to attend all follow-up visits, especially whilst administering antibiotic and steroid eye drops in the first weeks after surgery. Please ensure your diary can accommodate the time needed for post-operative care. These guidelines are intended to help you understand the nature of and how to prepare yourself for refractive surgery. Some patients will have additional questions. Please do not hesitate to contact us to ask. Above all, never proceed with surgery unless you are satisfied you understand all that you want to about the operation.